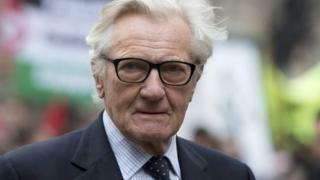 Senior Tory Lord Heseltine has said he will rebel against the government when peers debate the bill giving Theresa May the authority to trigger Brexit. He said he would support an opposition amendment in the House of Lords demanding MPs get a meaningful vote on the deal reached with the EU. Writing in the Mail on Sunday, he denied this would be a "confrontation". But Home Secretary Amber Rudd told ITV's Peston on Sunday programme: "I hope he will reconsider." Last week peers gave an unopposed second reading to the European Union (Notification of Withdrawal) Bill, following a two-day debate involving more than 180 speakers. MPs have already backed the proposed law, authorising Prime Minister Theresa May to inform the EU of the UK's intention to leave. Opposition peers want to amend the bill at a later date to guarantee the rights of EU citizens in Britain and the role of Parliament in scrutinising the process. As the government does not have a majority in the Lords, it is vulnerable to being outvoted if opposition peers - including Labour's 202 and the 102 Lib Dems - join forces. Mrs May has said she wants to invoke Article 50 of the 2009 Lisbon Treaty - the formal two-year mechanism by which a member state must leave the EU - by the end of March, and the government has warned the House of Lords not to frustrate the process. Lord Heseltine wrote in the Mail on Sunday: "The fightback starts here. My opponents will argue that the people have spoken, the [Brexit] mandate secured and the future cast. My experience stands against this argument." He also wrote: "This is not a confrontation with the government. It is to ensure the Commons can exercise its authority over the defining issue of our time." The former deputy prime minister, whose leadership challenge to Margaret Thatcher helped trigger her exit from Number 10 in 1990, campaigned for Remain in the run-up to the referendum. He has been a long-standing supporter of the EU within the Conservative Party and backed the idea of the UK joining the single currency. "I hope he will reconsider. There'll be plenty of opportunities to debate." Labour backed the government in backing the bill in the Commons. In a speech to the Scottish Labour Party conference in Perth, Labour leader Jeremy Corbyn said: "I accept that Brexit has unleashed uncertainty, instability and concern amongst many, many people. But we cannot simply wish away the result. "Can you imagine the reaction from those 17 million people, including one million from Scotland, who voted to leave the European Union if we simply ignored them?" However, Gina Miller, the investment manager who brought the successful legal challenge against the government, forcing the Article 50 issue to a vote in Parliament, accused the Commons of "cowardice" in giving the bill a "rubber stamp". She told the Independent: "I am hoping the Lords actually do what they should be doing constitutionally, exercising their parliamentary sovereignty, being independent, scrutinising the government and looking to put in amendments." Appearing on BBC One's Andrew Marr Show, she also said: "The will of the people does not negate the weight or wisdom of the Houses of Parliament." But Conservative Party chairman Sir Patrick McLoughlin told the same programme: "The bill got an overwhelming majority, one of the biggest majorities a bill has got on its third reading in the House of Commons and it's gone to the House of Lords. "The prime minister has said that there will be a vote once the negotiations are concluded. The prime minister won't conclude the negotiations if she thinks she's got a bad deal." The Leader of the House of Commons, David Lidington, told BBC Radio 4's The Westminster Hour: "We'll listen, with respect as always, to the Lords when they debate the bill." But he added that he hoped peers would not amend it, suggesting that to do so would go against the will of the people: "I still hope that the Lords will, at the end of the day, accept that this bill is in a particular position, unusual position, because of the referendum result." Richard Tice, co-chairman of the pro-Brexit Leave Means Leave campaign, said: "It is of little surprise that Lord Heseltine - who has historically put the interests of the European Union ahead of those of Britain - will try to sabotage Article 50. "Lord Heseltine's attempt to weaken the position of the prime minister ahead of negotiations with the EU is a truly unpatriotic act."